We used Sefir's services to coordinate a group of about 35 people flying in to Florence from all over the world. We used them for airport transfers as well as minibus transfers in Florence. There were a lot of last minute changes on our end, and they handled everything calmly and smoothly. Everything went off without a hitch, and we are so grateful for their attentiveness and professionalism. We would absolutely hire them again and recommend them highly! Working with Sefir has never been anything than a complete pleasure and they provide nothing but the best in terms of reliability and quality of service for our many university-related trips and transport requirements. 5-star service. 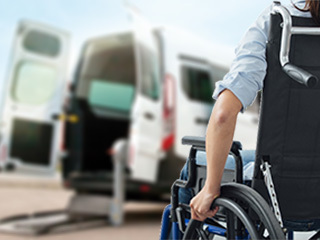 These are vans equipped with electrohydraulic platforms that allow passengers with reduced mobility, or on a wheelchair, to be brought to the floor level of the vehicle. Once inside, wheelchairs are locked to the floor by specific "universal" attacks, suitable for most "classic" wheelchairs, and to many "motorized" chairs. Are you looking for a job as a driver ? Or do you have other skills related to the industry?